Check out if International Commission of Jurists is in The Top 100 NGOs 2013 Edition! Strengthening human rights standards for 50 years. Presence in over 70 countries. For over five decades, the International Commission of Jurists has played a seminal role in establishing international human rights standards and working towards their implementation. Conceived in a divided post-war Berlin, the organization was founded by a collection of lawyers as a means to defend human rights during the Cold War era through the rule of law. Over time, however, it has reached greater prominence as an evolving standing group of 60 eminent jurists from around the world dedicated to the development, promotion and clarification of international standards. Supported by a secretariat based in Geneva, the International Commission of Jurists undertakes advocacy and policy work aimed at strengthening the role of lawyers and judges in protecting and promoting human rights. The organization’s current projects are focused on the ‘justiciability’ of economic, social and cultural rights, the human rights impact of counter-terrorism legislation, the role of human rights in international corporate responsibility, and mechanisms to address rights violations based on sexual orientation or gender identity. 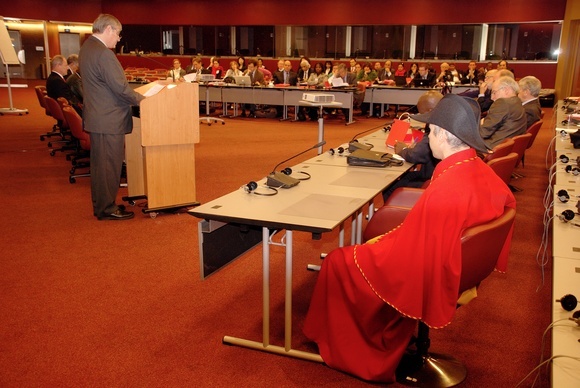 Alongside these thematic programmes, the International Commission of Jurists – including through its national chapters and affiliates in over 70 countries – works carefully at a regional level to provide technical assistance to governments and civil society actors, whilst building local capacity in the justice sector.